The heart of your business operations is the data center. This special center powers the technology that your business relies on each day. Unlike other aspects of your business, the data center works around the clock powering security systems, fire suppression systems, the computer network, centralized data storage drives, Internet servers, computer backup, and much more. Because the data center is so important, you should make its care a priority. Regular care and maintenance is required to keep your data center running smoothly. By working closely with qualified data center maintenance technicians, your business’s valuable data center will be kept in peak condition. It will always be there when you need it. Your data center is responsible for many tasks. As a data backup, it keeps copies of important files and software programs. This is important because if the primary computers are compromised you’ll need an accurate backup of important information. Compromise can happen in many ways. A building fire, earthquake, flood, or even a heavy storm can damage computer components and make using them impossible. Even if the computers themselves are intact, exposed to high temperatures, smoke, or damp can hinder their normal function. A data center will allow you to replace the files contained on the damaged machines; this seamless transition is only possible if data center maintenance is performed correctly. 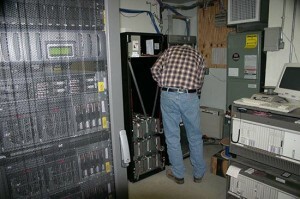 Data center maintenance consists of several elements. First, structural integrity must be maintained. That is, the physical components of the data center have to be free from damage. The maintenance technician assigned to the data center will begin their regular inspection by examining each element for physical damage. Though cracks and chips may appear to be only a cosmetic concern, these weak spots will spread. Given time, the delicate electronic components kept inside will become vulnerable t damage from the outside. Next, the technician will check to make sure that the data center’s climate controls are working correctly. Air conditioning and fans are necessary parts of data centers, especially large ones. Your data center will require a considerable amount of power; all this electricity generates heat that must be dispersed. If the heat isn’t channeled away from the computers, their performance will suffer; if too much heat is allowed to gather, the electronic components inside the computers will suffer damage. Finally, a data center technician will update software and replace any old components with up to date materials. This will ensure that all security protocols and information security procedures are in keeping with the latest developments in the field. Your computer system faces the threat of hackers and other unauthorized users. Keeping the security programs updated will help you prevent breeches of information. Data center maintenance needs to be an ongoing consideration. Make it a priority to work with qualified technicians. Only then can you feel certain that all maintenance tasks are being performed correctly.